Want a unique house plant? 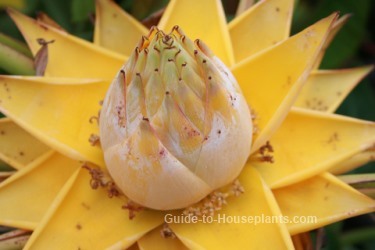 If you have a sunny spot for it, grow a Golden Lotus Banana indoors. Its pseudostems are formed from overlapping leaf sheaths. Healthy plants readily produce offsets, which can be divided and potted up. This generous plant just keeps on giving! Purely ornamental, this relative of the banana plant won't grow edible fruit. But mature plants (at least 2-3 years old) make an unexpected accent for your sunroom with big, colorful flowers and handsome leaves. Sometimes called the Golden Lotus Banana, its bloom resemble a lotus flower. You can expect those golden blooms to last several months. Repot in spring when necessary. Put it in a large container and give it plenty of room to grow -- its wide leaves fan out. And it's a good idea to use a heavy pot to prevent toppling. It can get top-heavy. Prune off damaged leaves, using sharp pruners. The leaves split easily, and over time can look ragged. Be selective in what you cut -- you don't want a stem with few leaves. These Chinese flowering bananas are virtually pest-free. Watch for the webbing of spider mites. You can raise humidity and prevent an infestation by misting the foliage with room-temperature water. Golden Lotus Banana is difficult to find at garden centers unless you live in a warm climate. Your best bet is online nurseries. Light: Bright light to full sun year-round. If your golden lotus banana plant doesn't bloom, it's not getting enough sun. 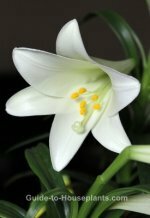 Give it at least 6 hours of direct sunlight per day in spring and summer.You can move your plant outdoors for the summer, just be sure to bring it inside when the temperature drops to 50°F/10°C at night. Water: All bananas are heavy drinkers and this Chinese relative is no exception. Keep the soil evenly moist in spring and summer, slightly drier in winter. If the leaves fold downward from the center rib and turn brown, the plant is thirsty. Humidity: Moderate (around 40% relative humidity). Temperature: Average room temperatures 65-75°F/18-24°C. It will tolerate temps down to 50°F/10°C. Fertilizer: Fertilize regularly. Your plant won't grow and flower without a steady supply of nutrients. Feed every 2 weeks spring through fall with a balanced liquid fertilizer diluted by half. Propagation: Musella lasiocarpa produces offsets, called "pups" throughout the year. Pups can be divided in late spring or summer. To detach, dig down to carefully separate its roots and pot it up separately. It takes about 2-3 years after planting an offset for it to flower.